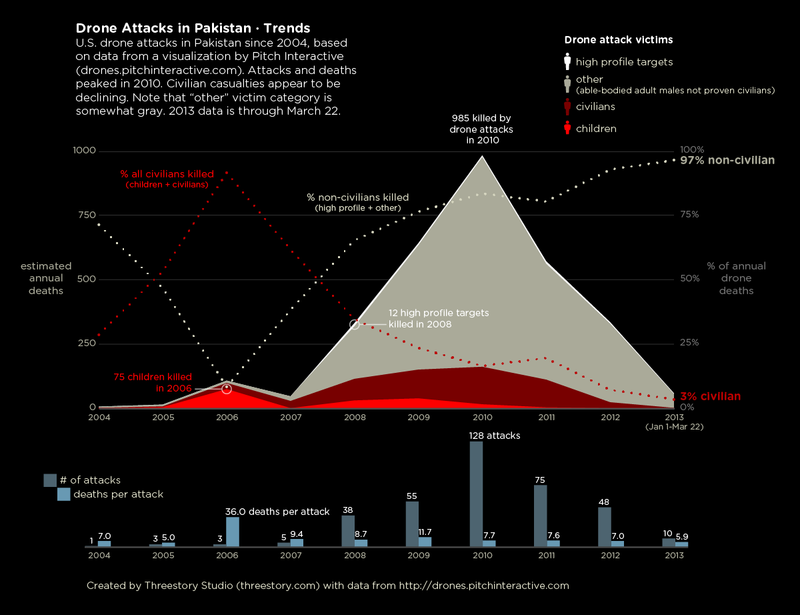 Several people have pointed me to a well-crafted data visualization by Pitch Interactive showing data for U.S. drone attacks in Pakistan. Like a good visualization should, it answered some questions and sparked a few more. To answer some of the questions that came to me, I put together this graphic that gives another angle on the same data. The bands of color represent total deaths by victim category. From the notes on Pitch Interactive’s site, it sounds like the victim categories can be a little fuzzy, with the definition of “other” depending on who is doing the defining. The Obama administration calls an able-bodied adult male a military combatant if it has not been proven that they are a civilian – here those are classified as “other”. The death totals are approximations too, as many reports include a range (e.g. “6-10 people were killed in a drone attack…”).